December 28, 2013 Egyptian Minister of Foreign Affairs Nabil Fahmy expressed Saturday Egypt’s hopes to improve relations with Qatar. ‘There was and still are disputes between us [Egypt] and Qatar. However, we are following and assessing the situation, hoping to witness practical and tangible steps … that reflect intentions to re-employ Qatar’s effort for the interest of the Arab region,’ said Fahmy during an interview with UK-based Sky News TV channel. Tensions have dominated relations between Egypt and Qatar, a former strong ally to the Muslim Brotherhood, since the ouster of Islamist president Mohamed Morsi 3 July. The oil-rich Gulf state was frequently criticised by Egyptian officials for the coverage of events by Qatari-owned Al-Jazeera TV network. The local Al-Jazeera channel, Al-Jazeera Mubasher Misr, has come under fire in Egypt since Morsi’s ouster, with accusations levelled against it of bias towards the Muslim Brotherhood and Egyptian officials claiming that the station poses a threat to national security. A number of Al-Jazeera journalists have been arrested and detained since Morsi’s ouster. On 3 September, a Cairo court ordered that the channel be taken off air, along with several channels deemed to be linked to Islamists. During Saturday’s interview, Fahmy went on to affirm Egypt’s ‘good relations’ with the majority of Arab states. 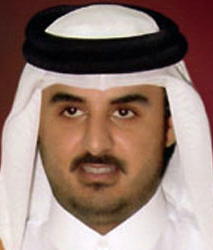 December 31, 2013 The Emir of Qatar, Shaikh Tamim bin-Hamad, has said that support for the Muslim Brotherhood is a ‘duty’ for which no thanks are necessary. His advice to the movement’s leadership in Syria is to unite the opposition parties and attend the proposed Geneva II Conference, it has been reported. The emir met a delegation from the Syrian Brotherhood headed by Ali Al-Bayanouni in Doha recently. The head of the political bureau of Hamas, Khaled Meshaal, who lives in the Qatari capital, was present at the meeting. The GMBDW has reported in late November that the Egyptians had opened what was described as a “diplomatic offensive” against Qatar over its support of the Brotherhood beginning with the closing of Al-Jazeera in Egypt. On December 30, Egyptian police arrested four Al-Jazeera journalists lleging that they had held illegal meetings with the Muslim Brotherhood and had broadcasted news “damaging national security.